Are you ready to incorporate project-based learning into your curriculum? 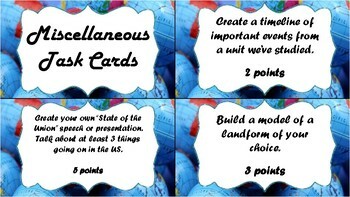 These are the extension project task cards that can be used for Social Studies. They include projects on current events, geography, and more! Each project is given a point value based on the depth of the project. These are fun projects that allow students to be creative while reinforcing learned concepts.